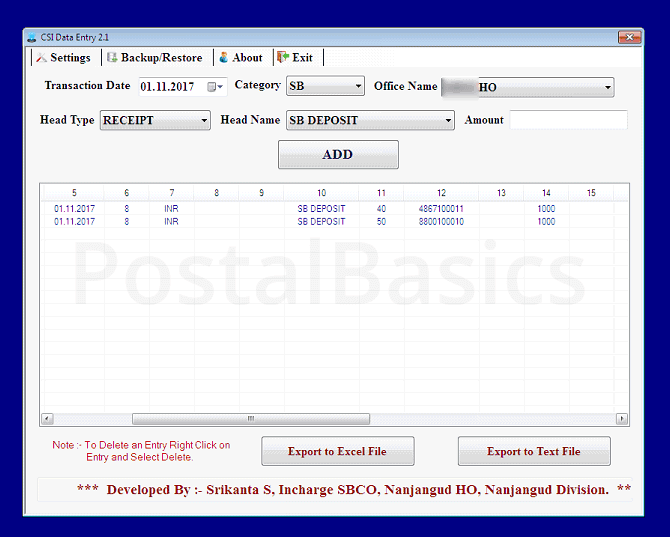 How to use CSI Utility Tool in Post Office? Core System Integrator is an integrator of all the system except Finacle and Mcmish transactions. We all know that, the Finacale is used for SB related transactions and Mcmish are used for PLI and RPLI related transactions. These transactions will not be effected on the Daily Account at all. Other than these, transactions like Epayment, Emo booking, letter, parcel, speed booking, all POS transactions, DPMS transactions are directly updated to your Daily Account. How to work on CSI utility tool? The SB related and PLI/RPLI related transactions should be fed in the SAP in order to get reflected in the Daily Account. So that you can tally the TCB and DA together. In order to feed to the SAP, we have F-02 or FB50 T-codes. But it is a hectic process to feed it. For that, you have to make a list of all SB and PLI/RPLI related GL codes and Profit Center numbers of your office as well as branch offices. To ease these procedures Srikanta S. Incharge of SBCO, Nanjanagudu HO has developed a tool called Voucher Posting Utility tool. He has included almost all GL codes and made easy to work in CSI. You can also add more GL codes in the settings. You have to add Profit Center numbers of your office and branch office before using this tool. Here is the link to download utility tool. Use the application at your own risk. We are not responsible for any harm caused. Open the CSI Data Entry tool. You will see the below window. Click on ADD. This amount will be added to list. You need not worry about these entries. Just be careful while entering the amount and selecting the correct Header Name. Similarly for each BO or SO, separately add all the transactions like SB/RD/TD deposit, withdrawal, PLI/RPLI collection amount etc. Once you have entered all the entries, click on Export to Text File. It will show the Receipt and Payment amount. 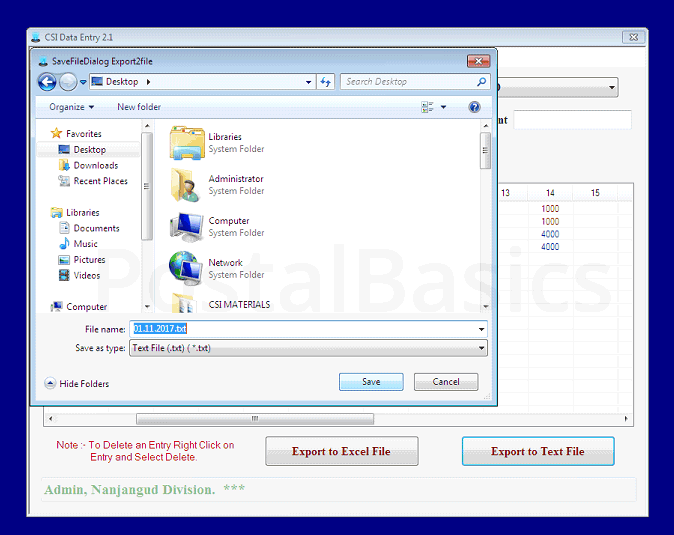 It is recommended to create separate text file for each BO and SO. Once you cross check the Receipt and Payment amount with BOs daily account, click Yes. A text file will be generated. Name that file and save it to the Desktop. Now, invoke the T-code ZBF07 in SAP. The below window will appear. Browse the File name and select the saved text file. Click on Background radio button and click on Execute. You should get a success message. Now, generate the DA of all SO/BO offices and confirm whether the amount gets updated to the correct GL head or not. How to apply for GPF withdrawal in CSI Post Office? 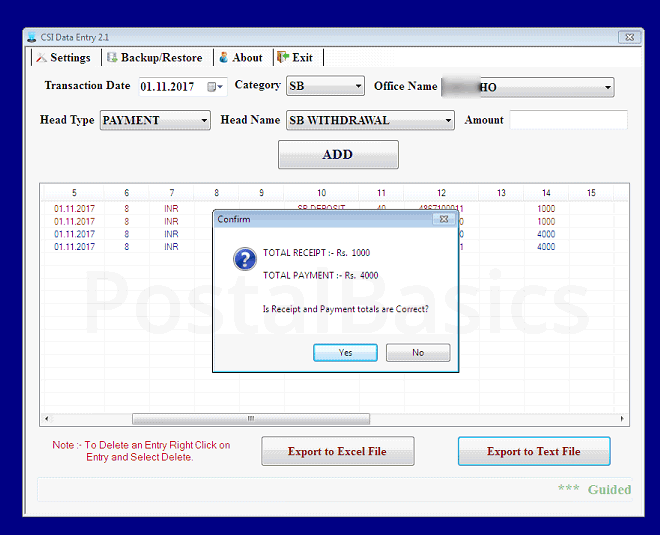 How to Perform the Bank Reconciliation in CSI post office? How to apply leave in CSI Post Office?